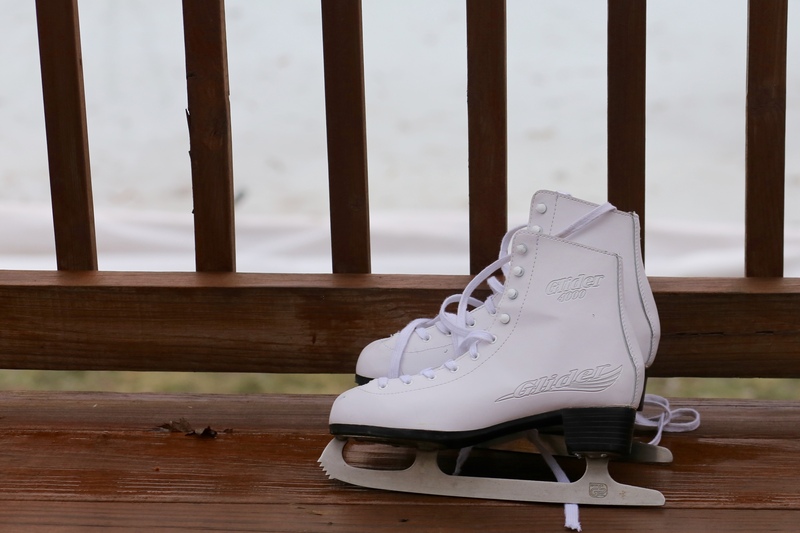 As you probably know from reading this blog, one of the ways we enjoy winter around here is on our backyard ice rink. I say “we” because it’s not just the kids who get all of the fun. I love strapping on my skates and blasting my tunes on our portable speaker and heading out to the ice. The only problem is that I have a major fear of falling. It’s with good reason. I break easily. Throughout my life, I’ve actually broken each of my arms twice. From the age of 5 to the age of 27, I broke both wrists and both shoulders. I wish I could say it was from some dramatic daredevil adventure, but I pretty much just fell down each time. As a result, I try really hard to stay upright. I don’t like to fall. Skating on a homemade ice rink isn’t quite as glamorous as going to an indoor facility with its big Zamboni and manicured ice. Our rink is subject to the ever changing weather, and we rely on warmer days and rain to help smooth out our ice. Our homemade Zamboni (think PVC pipe, hose and towel) only works so well. So when I skate, it’s with quite a lot of caution. Earlier this week, I went out in the evening with my girls. We were laughing and goofing off when I felt myself start to teeter. I was sure I could stop myself. I held out my arms. l tried to move in the opposite direction. But my teetering became a full blown totter. “I’m going down!” I told myself. My legs literally flew out from under me, and I flopped flat on my back. I just laid there, staring up at the dark blue sky. I think I’m still in one piece! Next, I had to confront my second greatest fear. I’m always worried that if I do fall, I won’t be able to get back up. The backyard ice rink doesn’t have any walls to use for balance or anything at all to grab onto when you are lying flat on your back. Somehow, without even thinking, I just leaned forward and popped right back up. I will admit, my legs were shaking from the experience. I stayed out on the ice another 40 minutes after that, but the pain in my back start setting in later that evening. Strangely though, as I was rubbing my sore aching neck the next day, I really started feeling good about that fall. I realized that I wasn’t nearly as afraid after I got back up as I had been before I fell. I also realized that my extreme fear of falling applies to many areas of my life. It’s only the second week of January, and I had already given up on a couple of ideas I had for this year, because of my fear of falling. Unlike my fear on the ice, my everyday fears are usually made up of three components. Fear of being critiqued. I’m often afraid of what people will think… Of being judged… Of people criticizing me for something when they don’t really know me or understand my heart…. Of being misunderstood. Fear that I’m not good enough. I’m not smart enough, talented enough. I’m too old, not cool enough, not popular enough. All of those. You know the drill. Fear that anyone else who tried to do the same thing would be way better. Basically, playing the comparison game. Everyone else seems to have more friends, more fun, more likers, more amazing photos on Instagram, more of everything that seems to define us these days. Oh, but laying there looking up at the twilight sky in the middle of our ice rink, I realized that falling isn’t really so bad. Yes, I’ve been rubbing my sore neck all week, and walking a little slower since the fall. But I didn’t break. I got back up. I didn’t let my fear keep me from blasting my music and skating with my girls. I’m glad I went out there, and I plan to do it again. And the best part? I’m not nearly as afraid of falling now. What about you? Do you have a fear of falling, either literally or figuratively? I love this, Emily! It resonates with me so much, as I have a fear of falling in pretty much all areas of life! I hope your back and neck are feeling better. That sounded painful! You articulated my fears in your three-part description PERFECTLY!! !